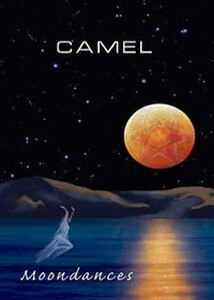 After the live compilation DVD's Camel Footage I and II and the live DVD Total Pressure (1984 concert), Camel Productions has released this live DVD (running time 2 hours) featuring Seventies live footage: the 1976 Moonmadness tour in the London Hammersmith Odeon and the 1977 Rain Dances tour in the London Hippodrome. Although there is only one year between these two concerts, there are remarkable differences in the line-up and the sound. The 1976 concert delivers a line-up with Andy Latimer, Peter Bardens and the rhythm-section Andy Ward/Doug Ferguson. Most of the 6 compositions clock around the 10 minutes and contain flowing shifting moods, drenched into a wonderful 24-carat symphonic prog tradition and embellished with excellent solos on keyboards and guitar: swirling Hammond organ, flashy Minimoog and exciting slide guitar (strong psychedelic undertones) in White Rider, a pitchbend driven Minimoog solo and an accellaration with fiery guitar runs in Lunar Sea and strong interplay of powerful Hammond and sensitive guitar in Dunkirk and Another Night (including a spectacular Hammond solo). But my absolute highlight is the 'classic' Lady Fantasy: swirling Hammond runs, a fluent rhythm-section, flowing changes of atmospheres, a beautiful part with Fender Rhodes electric piano and warm guitar and in the final part that sensational eruption with a mindblowing Hammond organ solo (wonderful images from the late Peter Bardens), this looks like a perfect tribute to him! The 1977 concert contains Richard Sinclair on vocals and bass and the famous Mel Collins on saxophones and clarinet, he succeeds to give an extra dimension to the Camel sound (like in Lunar Sea). Other changes are the keyboard sound of Peter Bardens (more string-ensemble and less Hammond organ) and the more song-oriented approach of the band since the release of the album Rain Dances (the band plays 6 of the 11 songs of that album). We can enjoy Andy Latimer with his Gibson double-neck guitar, the same as Jimmy Page uses during Stairway To Heaven and Andy also plays flute on Rhayader. I have never been a fan of Rain Dances but Camel delivers tasteful versions and lots of good solos on guitar (fiery in Never Let Go and One Of These Days ..), saxophone and clarinet (Unevensong and Lunar Sea), Minimoog (Highways Of The Sun and One Of These Days ..) and Hammond organ (Never Let Go). The bonustracks are 'studio audio recordings' in the original line-up line-up: Autumn (1973) and Riverman (1974), "no fillers, all killers" as Greg Walker uses to say! From all released Camel DVD's, I am mostly delighted about this one, mainly because of the 1976 concert (perhaps Camel at their artistic pinnacle) with that outstanding version of Lady Fantasy! My rating: 1976 concert 5 stars and 1977 concert 3,5 stars.